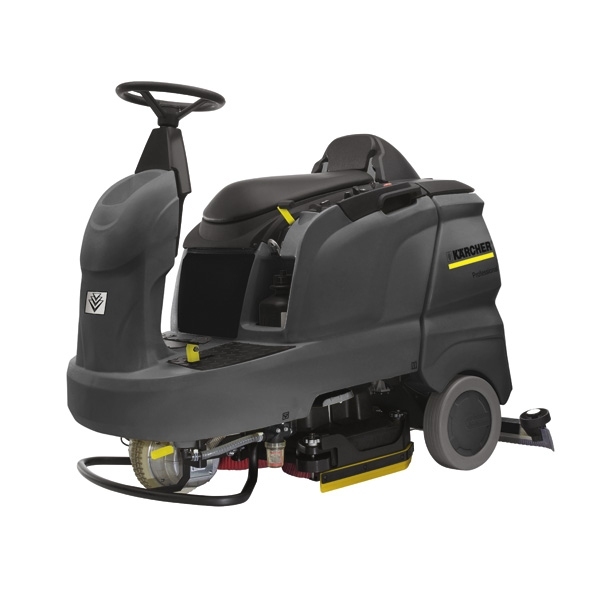 Compact, high productivity ride-on scrubber drier with advanced features. The extra short and sleek design makes this machine extremely agile and easy to maneuver – despite the large water capacity. 90° steering allows on-the-spot turning. A low centre of gravity guarantees good wheel grip. The basic functions are controlled with the EASY switch. Operating hours are displayed. Roller brushes save water and detergent. Large compartment for large battery capacity. Pack models include maintenance-free gel batteries. Two turbine power settings – save energy in the WHISPER setting. Easy to use. The basic functions are controlled with the EASY switch. All important information is shown and adjustments programmed via the display. For adjustment of the brush speed. For constant fresh water level control during operation.